Barack Obama | She speaks. I found the absolute best article from the Los Angeles Times. Its focus? 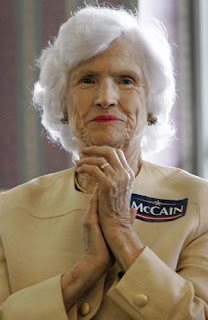 John McCain’s MOM, Roberta McCain. This woman is 96 years old. Let me say that again: She’s 96. God bless her and all her wisdom. Jeez. The article paints a candid picture of Roberta, but it sounds like the reporter wasn’t able to get much out of her. After all, she has been “muzzled,” as they say. She knows it; he knew it. I wonder why they won’t let the woman speak. She clearly has some great stories to tell. And a sense of humor to boot. I’d let her campaign as much as possible. I mean, it might kill her, but it might also kill John. (He’s 71, let’s not forget.) Americans like people they can relate to. Mrs. McCain has almost 100 years of relatability. I’d say that’s worth more than a some cheesy slogan. I wonder if Obama has an antiquated mama. Hmm, highly doubt that.